We came to Gyeongju because there are three UNESCO rated heritage sites here. The city itself is nice enough, but I'm not sure I'd plan a special trip here. Our preference would have been more time in the southern coastal area. This area attracts tourists because it has a lot of history dating back to the 7th and 8th centuries. The main temple, called Bulguksa was restored between 1969 and 1973 and even though it's one of the largest temple properties that we've visited, we can only figure that they charge admission because of the Unesco designation. Compared to some attractions around the world, the admission price is a very reasonable 4,000 won ($4.40), but compared to other Korean attractions (free! ), this one is overpriced. We took the local bus from town for 1,200 won ($1.32). It took over a half an hour, and when we got there we had to hike up from the parking lot to the temple gates. There, we paid the 4,000 won each, and we did so hesitantly because we saw how many tourist buses were there. The first thing that turned us off, is a huge modern structure inside the temple grounds. After reading what was going on, we understood why this is there, but I think we wouldn't have even gone if we had known ahead of time. And, it's a three year project which is nearing completion. This temporary structure will be torn down in the next few months after the pagoda inside is rebuilt. Here they are, rebuilding the pagoda. It's a three year project initiated because of a "crack" in one of the stones. This smaller pagoda has already been rebuilt. Pretty spot, but over run with tourists. Looking up to the mountain we were about to climb. 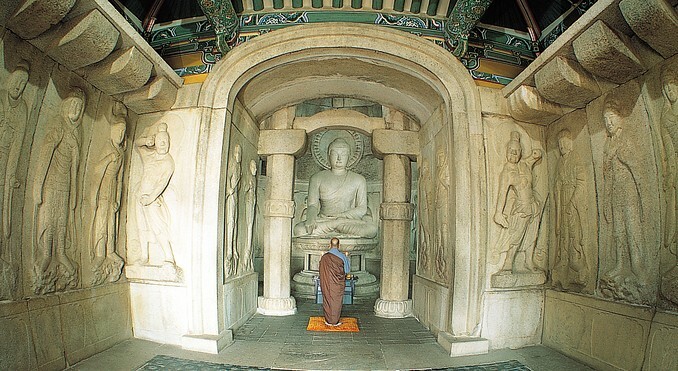 From Bulguksa, there are three ways to get up to the Seokguram Grotto. You can either drive, take a bus, or do a 2.5 km (1 mile) uphill all of the way hike. Up at the parking lot, we found out that we had to pay another 4,000 won ($4.40) each to view the Buddha in the Grotto. We were a little miffed at this because we were used to Korean monuments being free, and we had only just paid the same amount to view the temple which, to be honest, wasn't any better than the temple where we had done our Templestay last weekend, and it was free for anybody to visit. This monstrosity was in the midst of being torn down. Here, you can see the renovated temple building that houses the grotto. Amidst the rubbish. But even worse, was that they had at some point installed a glass or plexiglas box preventing any decent viewing of the statues. It was honestly the worst display of a Unesco site that we have ever seen. Absolutely terrible, and a waste of anybody's time. I checked tripadvisor reviews and found than most people are saying the same thing. Wish I would have read the reviews first. Lesson learned! Obviously taken well before the Mickey Mouse glass enclosure they built. Oh, and we weren't allowed to take any photos, so I can't show you what a poor job they've done. So, to make up for our disappointment, we decided to hike another half an hour to the top of the mountain. A nice view on a beautiful day always makes us feel good! The view looking towards the Sea of Japan. We hiked back down, and took the bus back in to town. We needed to find something to eat, and we had seen a market near the train station that looked interesting. Sure enough, a woman eventually pulled us into her stall where we ordered kimbap...a rice roll snack. She gave us a couple of other treats to go with it, and the bill was 3,000 won ($3.30). Where we had a late afternoon snack. Veggies in the market. Personally, we prefer Mexican markets! This is an ancient observatory. It was around sunset! I love getting a good sunset pic! We purposely planned to get to the Anapji Pond after sunset. This man made pond, (man made back before the 10th century!) has been restored along with three of the buildings that existed back then. It's a really pretty spot, and well worth a visit after dark. Don't leave it too late though because it closes at 8:00pm! Beautiful spot at Anapji Pond. Other than that one issue it was a wonderful day! Sometimes the best intentions are laid waste by the poor judgement of others. Hey, that could be one of those smarmy quotes that show up annoyingly too often on the Book of Face. Nice pics though. Keep on truckin'. So you hit a bump in your travels but I wouldn't chalk it up to a 'total. waste. of time.' I on the other hand enjoyed looking at the temple photos, your hike up the mountain, and beautiful pictures of the pond. I think Koreans are proud of their culture and heritage and able to share even if we think otherwise. We do hit a few Rita! Luckily this one had so many good things about the day that, that one issue was just small in comparison. Yes, Koreans are very proud of their culture and heritage and they love to share it with visitors. We totally agree with you on both accounts! Mexican markets are the best, although Guatemalan markets are really good too! Also some World Heritage Sites are over rated! Kevin said he wants to visit some places BEFORE they become a UNESCO site. I've had that "should have read trip adviser before I went" experience too. Such a shame that you couldn't visit in 6 months or so when all the work is finished although if there are too many tourists it wouldn't be fun anyway. But your pictures are really great. Yes, we have learned a lesson here, check tripadvisor first! Sherry, visiting it after the work is finished wouldn't have made a difference, our issue was with the finished permanent display, not so much the temporary structure that they were taking down. We can over look the dismantling part but the way that they have "tried" to protect the interior display has totally ruined the look of it. If you look at the picture that Kevin "borrowed" from the internet of the interior, see the very first area in the picture where it is wider and there are three carvings on each side (the antechamber), well this is where they have now placed a HUGE glass/Plexiglas BOX and it takes up that whole area, up until the archwayt just before where the monk is standing. By putting in the huge box you now have to look through two pieces of glass/Plexiglas in order to view the Budha and also because of this BOX you can't see the figures/craving in the archway before the Budha because of the shadows. Also before you used to be able to enter the room and look up at the ceiling and walk around behind the Budha and now none of this will be seen by the visitor. So all your money goes to just being able to walk by and get a glimpse of the Budha. We realize that they need to protect it but there had to have been a better way to have done that. It's really a total shame because it is an important and beautiful piece of history! They really have made a mess of things and then still charge you for it. I sure did like the end of your day. We enjoyed the whole day other than that one little bit! You still had a good hike and lots of great pictures! And that is exactly what we said to each other at the end of the day and when we looked at the pictures! I've also read TA reviews that were negative about places we wanted to visit, but in some instances our experience in those places turned out to be the exact opposite ... so we always take the reviews with a grain of salt ... different interests can color what people write about a place. In this instance, though, I think I would have shared the disappointment ... perhaps they will be better once those monstrosities are torn down. We also keep this in mind when we look at Tripadvisor. Kevin will not look at just one or two comments, he looks at many of them and he also looks at the dates that the comments were made, it all has relevance. Erin, please look at my reply to Sherry's comment as the temporary outside structure wasn't what the real issue was with. Agreed, it was unsightly but it was temporary. It was what they did to the permanent interior display that was the real problem and it totally took away from the whole experience. Luckily everything else that we saw and did that day, made up for the day. Just catching up with your travels. You have seen and done so much In South Korea. Best of all you've met some incredible people too. As you say...the kindness of strangers. I am off to Morocco tomorrow and will be back on the 2nd. By then I think you'll be off again so I wish you great times for the remainder of your time in South Korea! I will blog about Morocco upon my return. We have had such a great time and have met so many wonderful people who have opened up their homes to us and showed us what life is like in this amazing country. For us that is what travel is all about! Have a great time in Morocco and we look forward to reading about it. We had similar feelings today with Bukansan. WAY too crowded and over run. We do not like crowds and masses of people. Wow. Was a bit stressful and experienced some disappointment. However, like you said there are always positives to the day! Your photos of the pond and sunset are amazing & the fall colors look stunning! we rented bikes and rode around in gyeongju. I thought it was "meh" but what did make it special was that we went when it was cherry blossom prime time and it was incredible! We mostly rode around, visited the tombs, and then relaxed in a huge park. I am so curious as to what you think of Bukansan! We felt like it was overrated & found out we really don't care for city views. Much rather see views of just trees and nature!!! Sounds like you'll have a great last couple of days!! Now you have me second guessing about doing this hike! The colours in your pictures look lovely, but having all those people there is sounding like a turn off. There are a number of other places in Seoul that we can visit so perhaps Kevin and I will discuss this a little further and maybe make alternative plans. I think it would have been lovely riding a bike around Gyeongju. 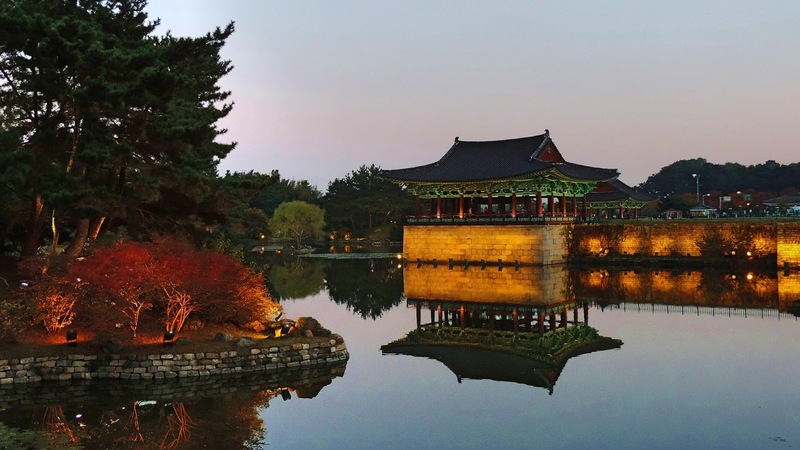 There is a lot to see there other than just the two UNESCO sites at Bulguksa. It also looked like there were some fantastic hikes in the mountain and hills surrounding Gyeongju itself. Busy hiking trail...but worth it! A look at our "love" hotel! Couchsurfing comes through for us again! Love it when a plan comes together - Jeju Island! Riding the rails at 300 km/h (186 mph)! Views of Seoul from our Han River cycling tour! Made it to Seoul, South Korea! What do we pack for a two month trip?